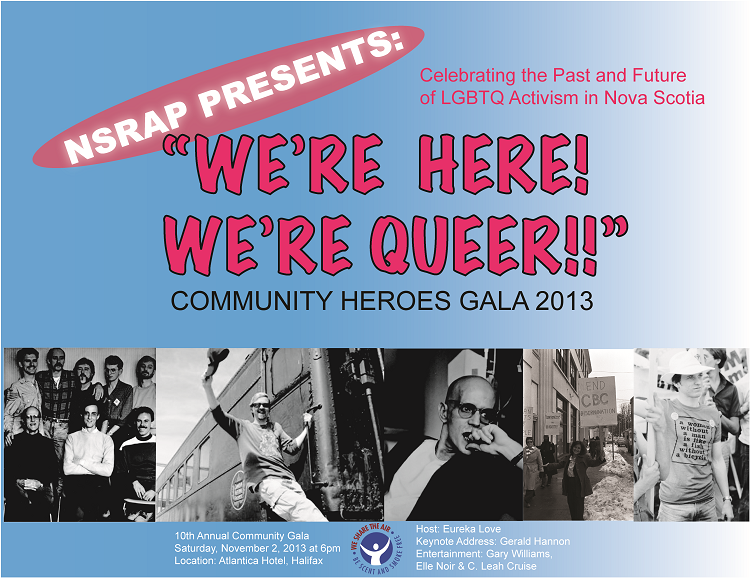 The Nova Scotia Rainbow Action Project (NSRAP)’s 2013 Community Heroes Awards Gala will be held on Saturday, November 2nd at 6 p.m. at the Atlantica Hotel (1980 Robie St @ Quinpool, Halifax NS). This is NSRAP’s 10th annual Community Heroes Gala, and our theme: “We’re here! We’re Queer! !” Celebrating the Past & Future of LGBTQ Activism in Nova Scotia reflects this important milestone. Every year the Nova Scotia Rainbow Action Project (NSRAP) presents a celebration of the very best in Nova Scotia’s Lesbian, Gay, Bisexual, Trans & Queer (LGBTQ) Community. We thank those individuals and organizations that have stood with us and inspired us, and we gratefully acknowledge those who’ve told our stories well. This festive evening consists of a cocktail reception featuring Garry Williams on piano, a silent auction, a three-course dinner with live entertainment, followed by a dance. 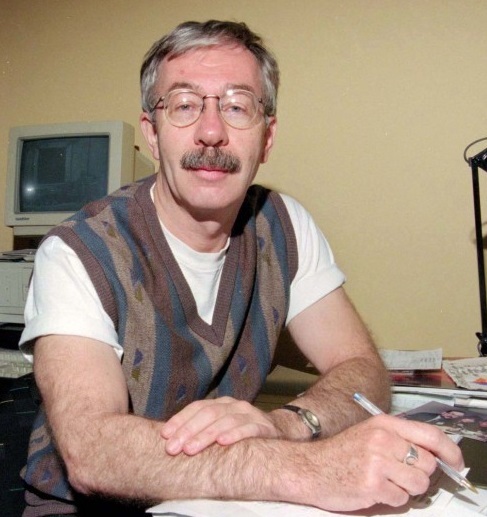 We are proud to welcome Canada’s pre-eminent queer journalist, founding member of The Body Politic, Gerald Hannon as our keynote speaker. Our Celebrity Hostess will be Miss Eureka Love (5 Minutes of Fame) and she will be joined by sister drag artistes C. Leah Cruise and Elle Noir, entertaining us with queer anthems past. Following the gala, Halifax’s hottest queer dance ticket, Heavy Petting will open up the dance floor for “We’re Here, We’re Queer: Let’s Dance!” Tickets for non-gala attendees are $10, payable at the door at 10:30 p.m. The Rev. Darlene Young Community Hero Award will be presented to the Valley Youth Project for significantly advanced LGBTQ causes. The Raymond Taavel Media Award will be shared by CBC Radio One’s Mainstreet and Maritime Magazine for representing our community fairly and respectfully. 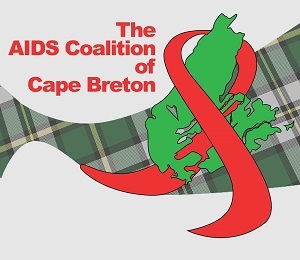 The Turret Stewardship Award honours the AIDS Coalition of Cape Breton for their exemplary leadership in equity for LGBTQ Nova Scotians. The Rising Star Award (new this year!) 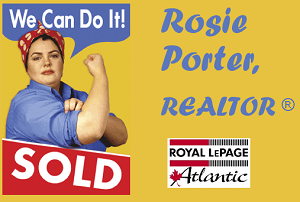 will go to Rad Pride Halifax to honour new organizations and young activists and to encourage their continued involvement in their communities. The Community Heroes Gala is high-profile event that has raised over $155,000 over the years, and provides most of our operating budget. The gala is an exceptional opportunity for large and small businesses alike to support the work of NSRAP while promoting their business to an exclusive and diverse patronage of Halifax professionals. Gala partnerships range from Silent Auction donations through Bronze, Silver, and Gold, to Platinum! Please note: this event is scent-free and physically accessible.